"It’s 1929 and Letty Larkspur and Cordelia Grey have escaped their small Midwestern town to chase big dreams and even bigger secrets. Amongst the glittering metropolis of New York City, they meet Astrid Donal, a flapper who has everything she could ever want, except for the one thing Letty and Cordelia have to offer—true friendship. Set in the dizzying summer before the market crash, against the vast lawns of the glamorous Long Island mansions and on the blindingly lit stages of Broadway, three girls will find scandal, intrigue, and romance. . ."
OMG the cover is pretty awesome. It tells you everything you need to know!! The girl is in her fabulous 1920's dress, her hair is of the style, even the font is 20's style. An absolutely perfect cover for the book! I've had this on my book shelf for a few months and like with lots of my books, sadly its taken me a while to get around to reading it. I'm so pleased I finally found the time. It was also a treat to read something that didn't have a paranormal twist to it, however much I love that style something different once and a while is great. The story kicks off by telling you the fates of the 3 starring ladies, but not who is dealt which card. I didn't expect to read that at all, but it made me eager straight away to want to know more about how things unravel. At first though I didn't realise this was going to be a series of books & so now I know that I'm going to become that much more involved with the characters and some sadness, heartbreak, happiness and more may be possible in the future. Only the best books can make you feel that much emotion though, I think this may just do it!! The story takes place in New York, an amazing city now and sounds just as amazing back in the glitzy 20's. Two of the girls are actually from a small Midwestern town & I would imagine them to be on the naive side, which does reflect some what in the story. They both seem to believe almost everything they are told, which to me would be unthinkable but I guess for the time it would be natural for girls to think everything is fine and wonderful. Also the girls lack of asking questions means that the story moves a lot faster, so thats got to be a good thing. The story is somewhat fanciful and idealistic in the people the girls manage to meet straight away. This was a little unrealistic for me, but again it moves the story along nicely and doesn't spoil the story in any way. I really loved the fact that the girls had such different storylines. They all blended nicely in the book, but contrasted vastly. It made for a very intriguing story. The book really does go full circle for all the characters from the begining to the end. Making this a rollercoaster of a book. You could get sickness with all the highs and lows. Wow I SO want to read this! Fab review! great review! I have this one on my kindle and I cant wait to read it! Thanks guys!! Yes this is a really great read - hope you both enjoy it!! 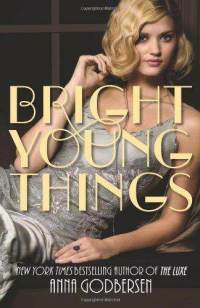 The detail in Bright Young Things is exquisite and really made the book great. As I said before, my knowledge of the 1920's isn't all that vast but I really felt like Godbersen created a rich, real world that it was so easy to be enchanted by. I thought it was going to be one of those books where only good things happen... But then everything bad happens and made it so much more interesting, i am ready to read the next one.